Yesterday marked day one of the 7th Multilateral Initiative on Malaria (MIM), the largest scientific conference focused on the global fight to eliminate malaria. 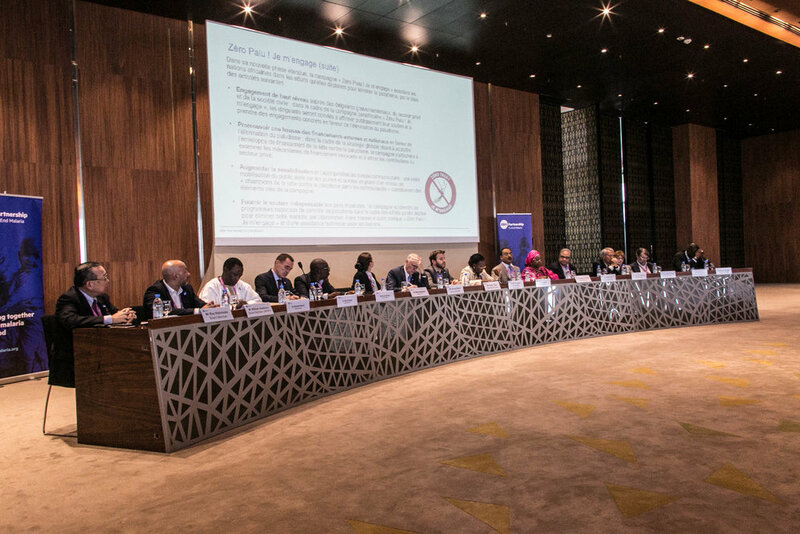 Once again, twenty years after the first MIM conference, scientists, researchers, policymakers, and heads of state are meeting in Senegal, this time at the Abdou Diouf International Conference Center (CICAD), to promote global collaboration and build research capacity in malaria-endemic countries across Africa. 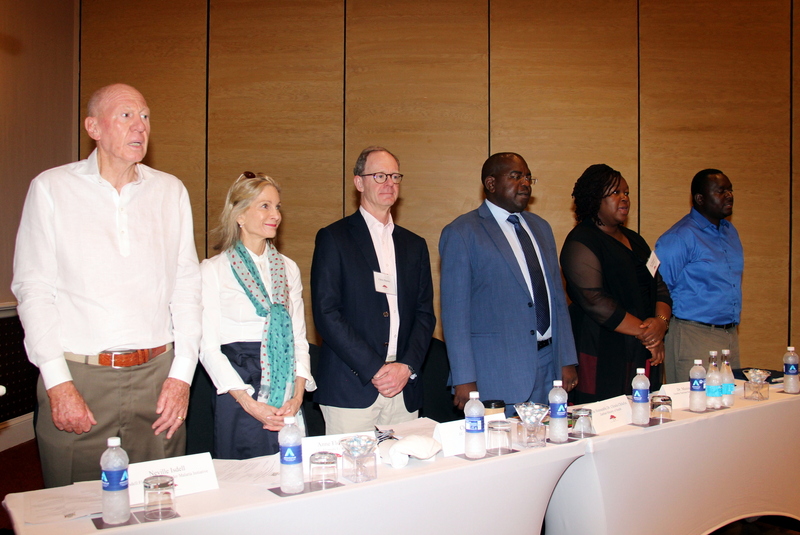 Taking advantage of the overwhelming presence of partners attending the conference, the RBM Partnership to End Malaria board convened for a dialogue, where the newly released strategic plan was introduced and questions were answered regarding the way forward for the new board. RBM Partnership to End Malaria board members convene a dialogue before the opening ceremony of the 7th Multilateral Initiative on Malaria (MIM) on 15 April 2018. After an introduction of board members by Board Chairperson Dr. Winnie Mpanju-Shumbusho, Senegal Minister of State, Prof. Awa Coll-Seck, welcomed the First Lady of Niger, H.E. Aïssata Issoufou, and reiterated the need for cross-border collaboration. Promote and advocate for sustainable malaria financing. Dr. Pedro L. Alonso, Director of the World Health Organization’s Global Malaria Programme, also announced that three African countries, Ghana, Kenya and Malawi, will be part of the first rollout of the malaria vaccine, RTS,S, reminding participants that tangible innovations and advances are being made towards elimination. Following the RBM dialogue session, the #MIM2018 opening ceremony was convened in the CICAD auditorium. Moderated by Ibrahima Cheikh Diong, Founder and Chief Executive Officer of Africa Consulting and Trading, highlights for the upcoming week were shared by Dr. Rose Leke, MIM Secretariat Director; Dr. Admasu; Prof. Omar Gaye, Chair of the MIM organizing committee and and Head of the Department of Parasitology of the Faculty of Medicine at Cheikh Anta Diop University; Dr. Magda Robalo, Director of Communicable Diseases at the World Health Organization’s Regional Office for Africa (WHO AFRO), who shared remarks from WHO AFRO Regional Director Dr. Matshidiso Moeti in her absence; and African Union Representative Mariama Cissé. Nobel Prize winner, Dr. Harold Varmus, on stage during the opening ceremony of the 7th Multilateral Initiative on Malaria (MIM) on 15 April 2018. Dr. Varmus’ plenary session, “The Spirit of Dakar” was the first for the week-long conference. 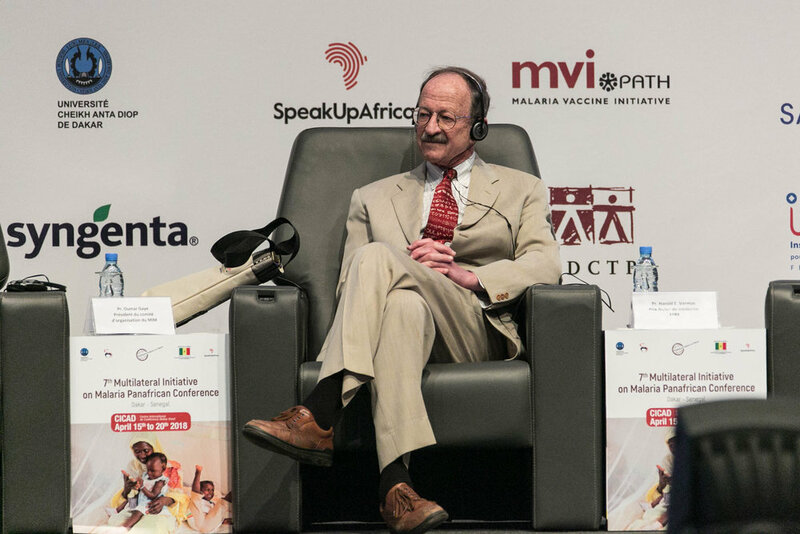 Nobel Prize winner, Dr. Harold Varmus, who was part of the MIM founding committee in 1997, led the first plenary session, “The Spirit of Dakar”, sharing that the “one unifying issue and rallying cry across Africa” at that time was malaria, and underscoring the work of the Malaria Research and Training Center, in Bamako, Mali, led by scientists Yeya Touré and Ogobara Doumbo. The Executive Secretary of the African Leaders Malaria Alliance (ALMA), Joy Phumaphi, used the ceremony as an opportunity to present Senegalese President, H.E. Macky Sall, with the ALMA Award for Excellence for his outstanding leadership in reducing malaria cases in Senegal by more than twenty percent between 2015-2016. 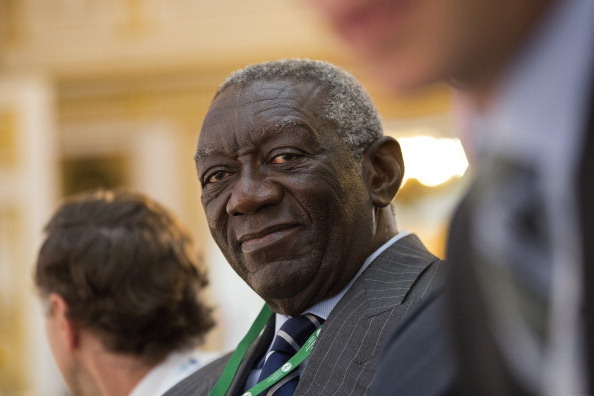 Senegalese President, H.E. 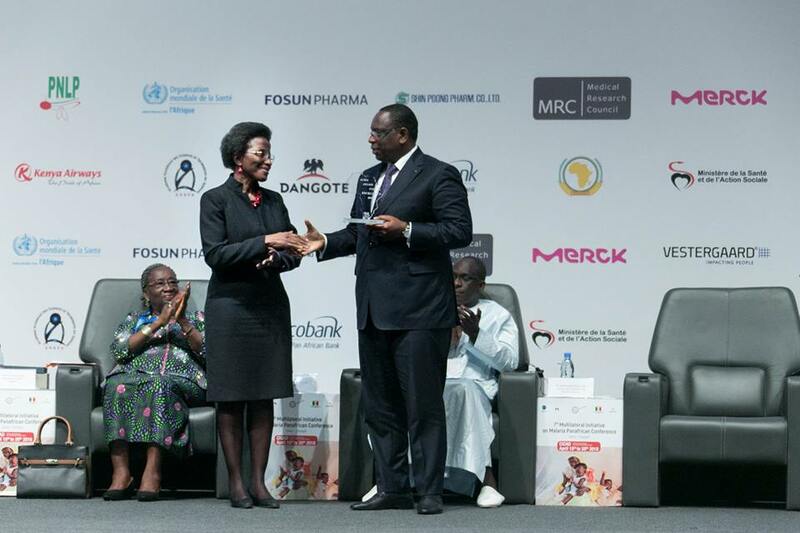 Macky Sall accepting the African Leaders Malaria Alliance (ALMA) Award for Excellence from ALMA Executive Secretary Joy Phumaphi during the #MIM2018 opening ceremony. « This reaffirmed commitment to building a malaria-free world underlines our common ambition to save lives and leverage human capital in order to strengthen our economies and ensure the well-being of our people, especially the most vulnerable. To reinforce our current gains and amplify results, the Government of Senegal progressively raised the budget allocated to health while creating a specific budget line to the malaria fight, » he said, closing the ceremony. The MIM conference, “Dakar II: Two Decades of Progress, Challenges and Perspectives in Ending Malaria”, will continue at the Abdou Diouf International Conference Center in Diamniadio, Senegal from 15-20 April. Focused on new research in malaria surveillance, diagnostics, drugs, vector control, vaccines and health systems, participants will discuss how these tools can be used to accelerate the fight against malaria, both globally and within sub-Saharan Africa. In addition, panel discussions, workshops and keynote speeches will discuss the tremendous progress made over the past two decades, as well as addressing the challenges to achieving complete elimination. For more information on MIM, visit www.mim2018.org.